For Nissan tire and brake service in Bedford, TX - near Dallas, Fort Worth, Arlington, and Irving - count on the Grubbs Nissan Service Center. 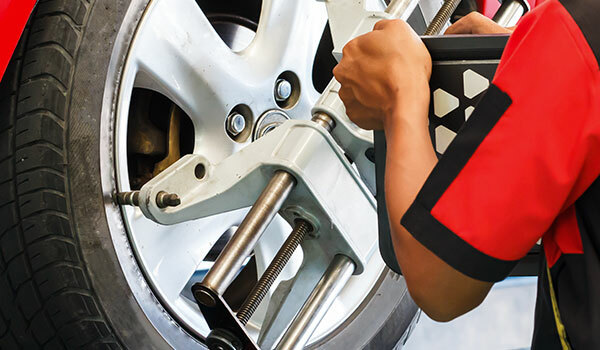 Both of these parts are crucial to your vehicle's safety performance, but you'll have peace of mind knowing that the Grubbs Nissan Service Center has the team with the experience to make sure your ride has brakes that are operating properly and tires that have the tread to get you to your destination safely. How Often Do I Need Tire Service & New Tires? For tires, you'll need them rotated every 3,000 to 5,000 miles, depending on the make and model of your vehicle. Your owner's manual will let you know the exact recommended interval for this service. As your tire tread wears down, you'll notice the wear indicators showing up. Another good tread test is to take a penny and insert it into the tread with Lincoln's head facing downward. If you can see the top of his head, your tires are in immediate need of replacement.Luckily, the Grubbs Nissan Service Center has a huge variety of tires for your vehicle in the brands you know and trust. Our technicians will mount and balance your new tires to the exact recommended settings so that you'll be rolling out on your way in no time. How Do I Know When My Brakes Need Service? While you want to make sure your brake system is inspected every 10,000 miles for signs of wear and tear - something we do for you here at Grubbs Nissan - there are also signs you might notice. Grinding or squealing noises when braking are a telltale sign that you need to bring your vehicle in for a brake inspection. You might also notice that your brake pedal seems soft when you press on it with your food, or your vehicle might start taking a longer time to come to a complete stop. If you experience any of these scenarios, bring your vehicle to Grubbs Nissan ASAP and let our certified technicians examine your brakes. They'll diagnose the problem and have your vehicle repaired in no time! If you believe your vehicle needs tire or brake service, contact us today or fill out our online form to schedule your service appointment!